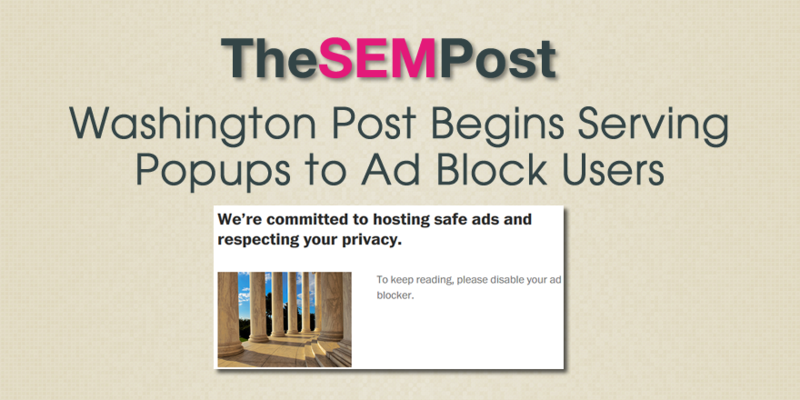 The Washington Post is becoming aggressive with site users who are using ad blockers by serving pop-ups overlayed on top of articles to all those users who have an ad blocker enabled and actively blocking ads on the Washington Post. If you are using either Firefox or Chrome while visiting Washington Post, you will see new pop-ups that are overlayed on top of every article on the site. For Firefox users using ad blocking, they see this pop-up when they visit the site. It continues to show for every page view. However for Google Chrome users, instead of asking for those users to disable ad blockers, they are instead asking for an email address and offering a free subscription instead, a free 6 week digital subscription. They are not making reference to ad blockers at all, but I never saw this subscribe popup until I had an ad blocker enabled. Chrome users cannot close this to read the article, as there is no close option and clicking outside the popup does not close it either. While many sites ask users to disable ad blockers, the Washington Post is definitely the highest profile news site that is targeting ad block users directly. Buzzfeed reached out to the Washington Post about the new change. “Many people already receive our journalism for free online, with digital advertising paying only a portion of the cost,” a Washington Post spokesperson told BuzzFeed News. Now that Washington Post is doing it, will other news sites begin doing the same? Would people be willing to unblock ads on news sites such as Washington Post in exchange for not having to deal with a traditional paywall?